Many visitors to Portugal whizz through the UNESCO World Heritage city of Évora on a day trip from Lisbon, quickly ticking off the Roman Temple, Praça Giraldo and the eerie chapel of bones before moving on. 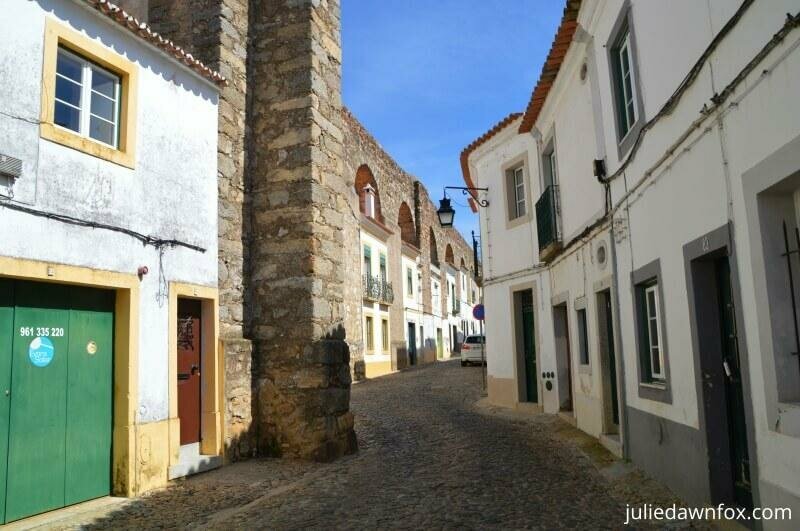 Dig a little deeper and you’ll find plenty of reasons to stay at least a night or two, especially if you want to use Évora as a base for exploring the Alentejo region. 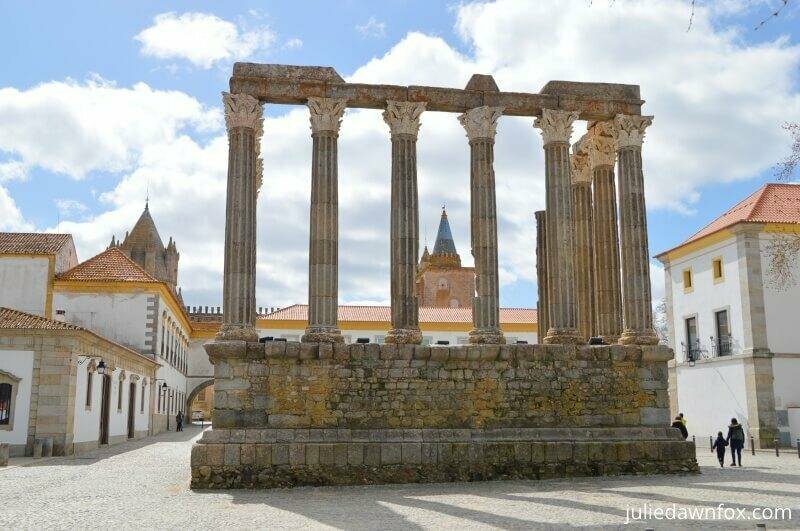 If you’re still not sure about how much time to spend in Évora, read on to discover Évora’s must see sights and lesser-known treasures. Among the best places to go in Évora is the haunting chapel of bones next to Igreja de São Francisco. This gruesome construction is one of the city’s most popular sights so expect it to be busy but it’s well worth seeing. The Franciscan monks who conceived this grisly project certainly knew how to drive a message home. With the aim of provoking visitors into contemplating the transitory nature of human life, they gathered up the skeletons of over 5,000 dead from the town graves and used them to build this chapel. Five centuries later, the eerie atmosphere provides modern visitors with a grim reminder that despite medical and technological advances, there’s just no escaping death, no matter how rich or important you may be. “We bones that are here are waiting for yours,” warns the inscription carved into the stone lintel above the entrance. Once inside the chapel, you will be surrounded by evidence of human mortality. Every wall and column is crammed with the knobbly ends of femurs interspersed with rows of skulls and lengths of arm bones, all painstakingly arranged into artistic patterns. Even the vaulted ceilings are studded with rows of craniums and the traditional pictures of podgy cherubs have largely been replaced by paintings of gaunt skulls. Practicalities: Praça 1º de Maio. Open daily from 9 am to 5 pm November to March and until 6:30 pm from April to October. The €4 entrance includes access to whatever temporary exhibition is on (it’s nativity scenes until October 2018 – some of them are strange, to say the least) and a religious art exhibition. To the left of the renovated 15th century church of St. Francis are the attractive public gardens. Amid the bushes, paths and ponds, you’ll find a ruined building which a pride of peacocks have claimed as their territory, making for some potential Instagram moments. The rather splendid building just inside the park is what remains of the 16th century Royal Palace, once integrated into the Franciscan complex. We arrived just as people were gathering for mass so we spent very little time in the main church and headed straight for the cloisters. As the only visitors at that time, we were able to admire the vaulted ceilings, arches and stone roses in peace, apart from the clanging bells. The founder’s chapel in the far corner contains a beautifully carved marble tomb of Dom Pedro and a depressed lion. There’s little information about the building so we almost missed the spiral staircase to the roof of the cloisters (it’s opposite the toilets). It’s worth the climb for the city views, the close up of the gigantic rose window and the 14th century relief carving of Gerald the Fearless, aka the Giraldo of Praça do Giraldo. This local hero was instrumental in turfing the Moors out of Évora in 1167 during the reconquest that resulted in the creation of Portugal as a country. Practicalities: Largo do Marquês de Marialva. Open daily from 9 am to 5 pm (last entry at 4:30 pm). Tickets range from €2.50 to €4.50 depending on how much you want to see. We paid €3.50 as we didn’t bother with the sacred art museum (you can see plenty of this in the Evora Museum). Walk around the back of the cathedral and you’ll find one of Evora’s hidden gems. 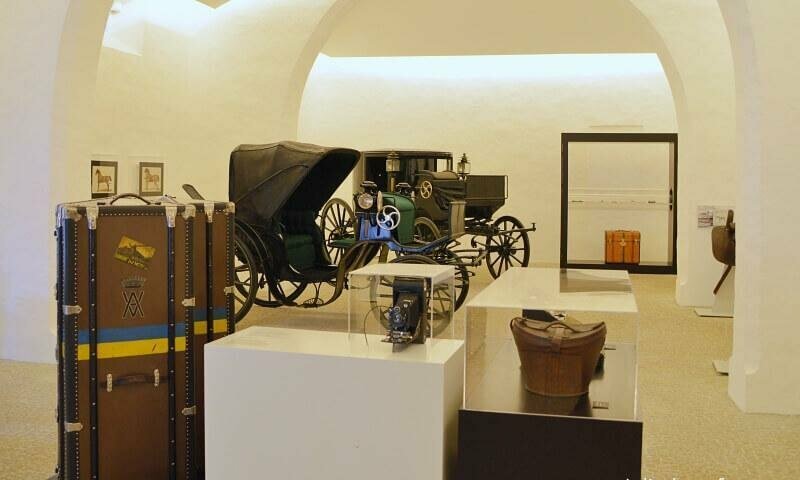 Part of the Eugénio de Almeida Foundation, this small museum displays the family’s fine collection of carriages and associated items. Watch the short video for context and an insight into the lives of this high profile family. Practicalities: Páteo de S. Miguel, Largo Dr. Mário Chicó. Open Tuesday to Sunday from 10:00 am to 12:30 pm and from 13:30 pm to 18:00 pm. €1. In front of the cathedral you have the city museum. Having spent the previous morning on a tour of the nearby megalithic monuments, Jules and I were keen to see the first room of the Archaeology section. It contains the engraved slate plates, ceramic dishes, beads and other treasures that were placed with the dead inside the Neolithic Zambujeiro dolmen. The exhibition progresses through the Bronze and Iron Ages to the Roman era. As you might imagine for a city that was important enough to have a Roman temple, there is no shortage of Roman sculptures. The upper floor of the museum is replete with religious art including the altarpiece from Evora Cathedral and paintings by Grão Vasco. Practicalities: Largo do Conde de Vila Flor. Open Tuesday to Sunday from 9:30 am to 5:30 pm November to March and 10 am to 6 pm April to October. €3. Both Jules and I are fresco fans so we were keen to see the Casas Pintadas (Painted Houses). These paintings of mythical creatures and other animals represent moral characteristics, virtues and vices and adorn a 15th century nobleman’s house. While this artwork is around 500 years old, the exhibitions inside the Centro de Arte e Cultura are utterly modern, providing an interesting contrast. Make sure you go to the top floor to see the Inquisitor’s Room. It’s so dark that you can barely see the painted ceiling – instead, the details are projected onto a lumpy light display on the floor. Practicalities: Largo do Conde de Vila Flor. Open Tuesday to Sunday from 10 am to 6 pm (7 pm May to September). €1 including entrance to the contemporary art exhibitions and the Inquisitor’s Room. A surprisingly small but reasonably well-preserved Roman temple dating back to the 1st century AD dominates the square in front of the museum. It was a hub for the city’s activity for a couple of hundred years until Germanic invaders destroyed it. You can’t go inside but if the weather’s nice and you want to simply contemplate its history, there’s an outdoor café in the small gardens beside the temple. One side of the Roman temple is flanked by the Archbishop’s palace and the other by the Cadaval Ducal Palace. This latter palace adjoins the Church of Loios, which in turn is connected to the former convent, now luxury hotel. The church is a wonderful example of how specially commissioned azulejo panels were used for floor-to-ceiling decoration and illustrations of saintly lives in the early 18th century. However, unless you pay €4 to step behind the thick red velvet curtain, you won’t get to see this as it’s still private property. Practicalities: Open Tuesday to Sunday from 10 am to 6 pm. €4. While not as impressive (in my eyes) as the University of Coimbra, as one of Portugal’s longest running universities, Evora’s seat of learning is still worth a visit. The stunning cloistered courtyard is lined with lecture rooms that ooze history via their blue and white tile panels and the Grand Hall has some intriguing designs. Practicalities: Largo dos Colegiais, 2. Open Monday to Saturday from 9 am to 8 pm except holidays. €3. Jules and I were staying very near to the 15th century aqueduct so we followed a tiny section of its 18 km length into and out of the heart of the walled city several times. This gave us ample opportunity to marvel at the impossibly narrow houses that have been built into the arches of this medieval waterway. You can even stay in one of them! We had intended to visit a nearby winery but ran out of time. Instead, we went to the Rota dos Vinhos do Alentejo tasting room, shop and information centre. For €3, you can taste 6 or 7 wines that are being featured that week. If you like any of them enough, you can buy some, or any of the other bottles they have in stock. I was pleased to have the opportunity to taste some vinho da talha – wine made in giant terracotta urns like the one in this photo. Practicalities: Praça Joaquim António de Aguiar 20. Open Monday to Friday from 11 am to 7 pm and Saturdays from 10 am to 1 pm. As the name suggests, M’AR De Ar Aqueduto offers unrivalled views of the 15th century aqueduct. A palace that dates back to the 16th century has been transformed into a contemporary hotel with spacious deluxe rooms that have a private terrace leading onto the gardens and smaller but still attractive standard rooms. The outdoor pool is a refreshing place to unwind after a day of sightseeing, as are the hotel’s bars and restaurant. Or the spa. Just inside the city walls, it’s easy to drive to and there’s onsite parking. All the city centre sights are within walking distance unless you have mobility issues, in which case, the pousada (see below) is more central. Check availability and prices. 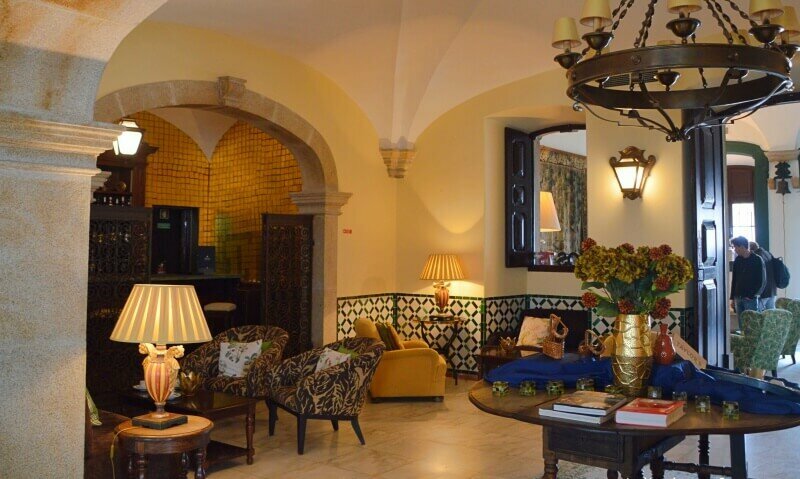 For a luxury historical hotel right in the very centre of the city, the Pousada dos Loios is the one to go for. Classically decorated bedrooms were once the sleeping quarters for the monks so some are a little smaller than you may be used to. Some bathrooms have claw footed bathtubs. Public areas are bursting with charm and original tiles, stonework and period as well as comfortably classic furniture. Choose a room to suit. If you want to stay at Convento do Espinheiro, a car is advisable as it’s about 3 km outside of the historical centre. The beautiful 16th century convent is full of atmospheric arches and offers a range of luxurious rooms and suites, some with gorgeous views of the surrounding countryside. Pet-friendly with an outdoor pool, decent spa and onsite restaurant. See photos and grab a room with a view. The Noble House guesthouse is in a recently renovated traditional mansion which retains the best of its original features, such as tiles, stone columns and vaulted ceilings. Luxury, style and comfort are key and the location is extremely central. Breakfasts are noteworthy and there is onsite parking (for a fee). See photos and check availability. Victoria Stone Hotel is larger and more modern in concept and style with two onsite restaurants, a rooftop swimming pool and spa facilities to make your stay as stress-free as possible. Located just outside the city walls, it offers free parking and internet and great views of Évora from the rooftop. Choose a room or suite to suit. If you like minimalist decor and clean, bright contemporary architecture, Evora Olive Hotel would suit you. Featuring an indoor pool, onsite restaurant and free parking, it’s also extremely central in terms of Évora’s main sights. See photos and check availability. Hotel Riviera is full of history and charm and smack bang in the centre of Évora so it’s great if you don’t have a car to worry about although if you need parking it can be booked in advance. Light sleepers may prefer a room away from the street. Domed brick ceilings, stone doorways and tile panels are just a few of the distinctive features. Be warned that there is no elevator. See photos and reviews. 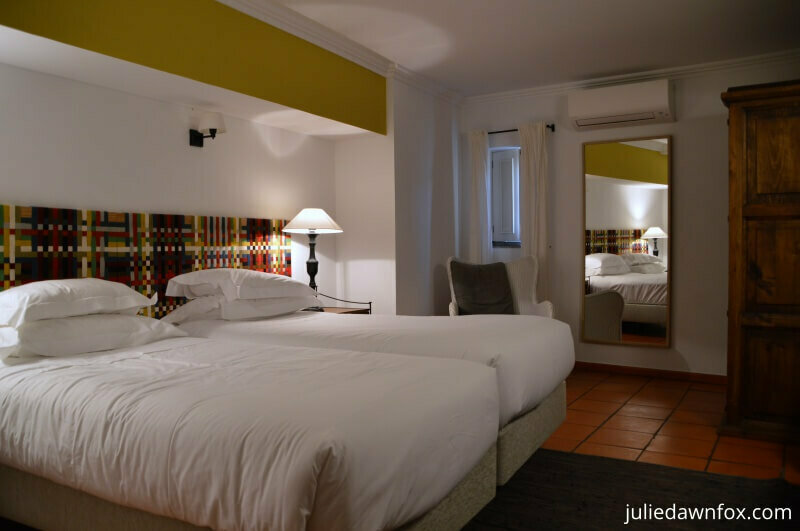 If you prefer bright and modern hotels, take a look at Stay Hotel Evora, also very central. It has all the basics for a comfortable stay including air conditioning. Check availability and reviews. Casa do Becco dos Assucares is a delightful 1-bedroomed apartment in the city centre with arched brick ceilings. Tastefully renovated to a high standard with a well-equipped kitchen if you want to prepare your own meals. The experienced AirBnB host is friendly and helpful and provides a welcome pack of basic supplies. Parking is possible on the street but may be a bit tricky at busy times. See photos and reviews. For a truly unique accommodation inside the arches of the aqueduct, take a look at Casa do Aqueduto da Prata. You might not think it from the outside but this is a 2-bedroomed house with modern decor and a small roof terrace. There’s free parking nearby and Maria is an excellent host. See photos and check availability. Probably my favourite restaurant in Evora is Taberna Típica Quarta Feira. 3 generations of the same family work tirelessly to produce delicious Portuguese food served with a smile. You don’t get to choose what to eat – it’s whatever the chef decides is the dish of the day. I’m a bit squeamish about fatty meat but we had braised pork neck which was slow cooked, tender and tasty and not too fatty at all. This was after a myriad of starters and followed by an array of desserts. At €30 a head including house wine, it was excellent value. Reservations are essential. Cash only. Rua do Inverno 16-18. Open for lunch Tuesday to Saturday and for dinner from Monday to Saturday. Another rustic traditional restaurant with red and white checked tablecloths and a simple menu chalked on the wall is Adega do Alentejano, where the house wine is still drawn from large wooden barrels. After hearing that this is THE best place for my favourite tomato and bread soup, we booked a table. At this restaurant, not only do you get a poached egg in the soup, it comes with a side dish of fried Portuguese sausages. We also had the bacalhau dourada (golden cod), which was home made and tasty. Rua Gabriel Victor do Monte Pereira 21A. Open for lunch and dinner Monday to Saturday. Cash only. We found a lovely ‘secret’ café down the side of the Carriage Museum, just through a gate on the left. We weren’t even sure it was open to begin with as we were the only ones there. The interior is lovely but the main feature is the outdoor terrace. Pateo de São Miguel. Open Monday to Saturday from 10 am to 5 pm. If you like pasteis de nata, Portuguese custard tarts to die for, or just pies in general, try the Fabrica dos Pasteis (Pie Factory). Tucked away on a side street near Praça Giraldo, you can eat in or take away but either way, you’ll be getting freshly baked sweet or savoury pies to make your mouth water. Alcárcova de Cima 10. Open Tuesday to Sunday from 10 am to 9 pm. There are several trains (approx. 1.5 hours) running daily from Lisbon Entrecampos station. Driving is easy as it’s motorway pretty much all the way – it takes around 1.5 hours, depending on traffic. If you are short on time and don’t have a car, there are several full day tours from Lisbon that include time in Évora. 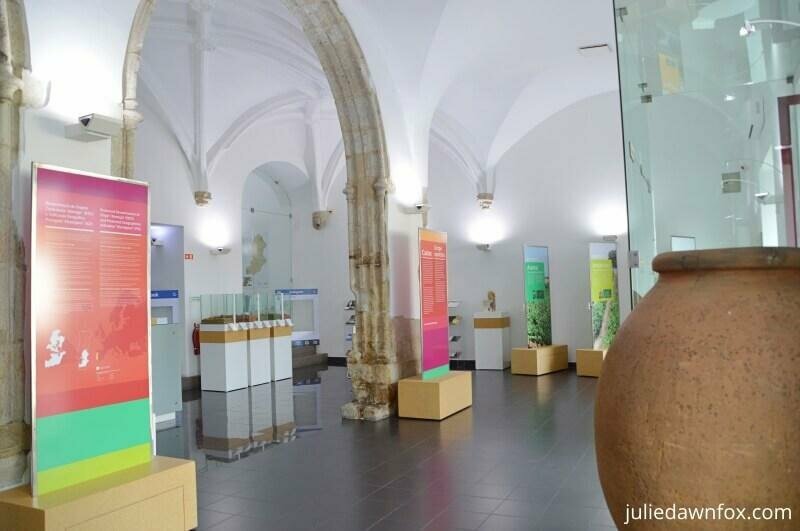 For example, this comprehensive small group tour includes a visit to the megalithic standing stones at Almendres, a visit to the bone chapel, free time in Évora and an olive oil tasting. Click to check availability and prices and book online. If your focus is more on the wine than the history, you may prefer this full day tour to Evora and two nearby wineries. Hello, so glad to have discovered your website. I have signed up. My husband and I purchased a small studio apt in Paco de Acros and are back now for 4 mos to explore this beautiful country. We are going to Evora in the next few weeks for 4 days and staying just outside town to enjoy the area. Your suggestions for the town are most helpful- thanks! I will get back to you again when we next venture out of Lisbon. I remember visiting Evora many years ago, but we never visited the Chapel of Bones. I enjoyed your updated review of Évora, and you’ve pointed me to one or two places I didn’t know. I’m a great fan of the tomato soup at Adega do Alentejano, too. Re the Cathedral cloister – on our last visit, I nearly spent the night on the roof as they locked the door while I was up there! Thank you for providing so many fascinating places to see in Evora. We plan to visit there sometime in the next 10 days. It has been on our list for our 1st time visit to Portugal. Too bad there seems to be so much rain this year. We will spend a week in Lisbon and then a week in Oporto. We still need a little help in deciding how to best see the Douro Valley, even after we read your info. Thank you for your valuable information on so many places!! Must be awesome place. Thank You for Your excellent travel tip. Sounds fascinating. A must see maybe next time in Portugal.